The magic number in Northern California this weekend was three. Three spectacular days, three incredible drum corps shows and three past DCI World Champions. It was, in a nutshell, a drum corps fan's dream weekend. The Blue Devils perform their encore in Stockton this past weekend. The Weekend of Champions kicked off on Friday night at Alonso Stagg Stadium on the University of the Pacific Campus in Stockton. While the weather was hot early in the day, the evening breeze made it quite comfortable for the 4,000 or so fans that made the trek to Stockton from throughout Northern California. The 12-corps lineup provided an excellent cross section of West Coast drum corps and included performances by the Blue Devils, Santa Clara Vanguard, Seattle Cascades Blue Knights, Mandarins, Pacific Crest, Troopers, Vanguard Cadets, Blue Devils "B" corps, Fever and River City Regiment, Sr. The evening also included an exhibition by the always-entertaining, Blue Devils "C" corps. "We were a little concerned with attendance since we didn't run a show last year," said Sponsors of Musical Enrichment's (S.O.M.E.) Mike Canote, one of the sponsors . "But the combination of a great lineup of drum corps and the partnership with DCI, the Vanguard and Blue Devils to market the weekend of Champions was really beneficial in helping us to have a great crowd." S.O.M.E. produces the Moonlight Classic to raise funds for the purpose of supporting local youth organizations and the performing arts on a continuing basis. 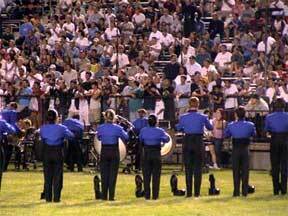 It also provides support to DCI by underwriting the Individual & Ensemble competition at the World Championships. The evening saw the Blue Devils take the Gold medal in Division I competition with a season-high 80.80. Capturing the Silver and Bronze medals were cross-Bay rivals the Santa Clara Vanguard (76.75) and Denver's Blue Knights (69.40). The Seattle Cascades placed fourth with a 68.40 with the Mandarins (66.10) and Pacific Crest (65.55) within striking distance. The Troopers completed the Division I lineup with a score of 57.15. Division II saw the Vanguard Cadets capture the Gold medal with a 66.30, with Blue Devils "B" winning the Silver with a 63.10. California's newest Division II corps, Fever, took home the Bronze medal with a 52.60. In the Senior Division, Sacramento's River City Regiment took home a gold medal with a 53.10.